How Often Do You Put Screws on a Metal Roof? A metal roof should last as long as your house. As long as it is properly installed, metal roofs are really good at keeping out rain water, protecting against high winds and shedding snow. But you will need to make sure your screws retain their seal and do not come loose. It's imperative that a metal roof be installed correctly. Standing seam roofs have broad, flat panels with protruding seams that interlock, giving the roof lots of strength. Standing seam panels are usually 12, 16 or 19 inches wide, and made from aluminum, galvanized steel, zinc or copper. The panels overlap, with each panel concealing the fastener of the previous panel. That makes these concealed fastener screws likely to last much longer and less likely to fail. One of the biggest problems homeowners have with other types of metal roofs, however, are exposed fasteners. Standing seam roofs typically have hidden fasteners. Many other types of metal roofs, including corrugated metal roofs and metal roofs that resemble standing seam, but are not, come with exposed fasteners. Exposed fastener metal roofs are cheaper to install, and easier to do it yourself, but come with some caveats. If your metal roof comes with exposed fasteners, you must make sure the screws are installed correctly. Make sure you follow the metal roof installation instructions. Be sure that the panels are properly screwed together. You will need a fastening system that accommodates the expansion and contraction of the metal. Without this, the fasteners could come loose, and the roof could develop wavy spots. At least twice a year, you want to inspect your metal roof fasteners for potential movement in the screws, or sealant failures. This is especially important if you have exposed fasteners. Check all screws and fasteners to make sure they are tight. Movement can thrust screws out of their holes. If you see a screw, and possibly threads, sticking up above the level of the gasket or roof panel, you will need to refasten it. Check your attic at least twice a year, if not more often, for leaks. Metal roof screw placement must include good sealants. Sealants may fail around the screws. They typically last about 20 years, but roof panel and fastener movement can damage it. Also, the gaskets that come with the fasteners can fail. Check for tightness, discoloration, corrosion or breakage. Corrugated roof panels and other exposed fastener metal roofs are usually held together with screws every 18 inches or 2 feet. You will want to note your metal roof screw pattern, so you know where to look for potential problems. When replacing the screws, for whatever type of metal roof you have, you will need to use aluminum or galvanized steel screws with rubber or plastic washers. Screws are the best way to hold your panels in place, so don't ever use nails when installing or replacing screws in your metal roof. Screws will not bend or work themselves loose during normal expansion and contraction. Use high quality, metal self-tapping screws with thin washers to be sure you have a secure seal. Use the manufacturer's recommended screw gun to tighten the seal, and make sure you create a tight seal, but without using excessive pressure. Once a screw looks weathered or compromised, replace it. It's important to use screws approved by the roof manufacturer when redoing your metal roof screw placement. Make sure your roof has good waterproofing barriers, especially if you live in an area with a lot of rain or humidity. The same is true if you live in a hurricane-prone area. Good insulation will also protect your house from moisture damage if you do have a leak. 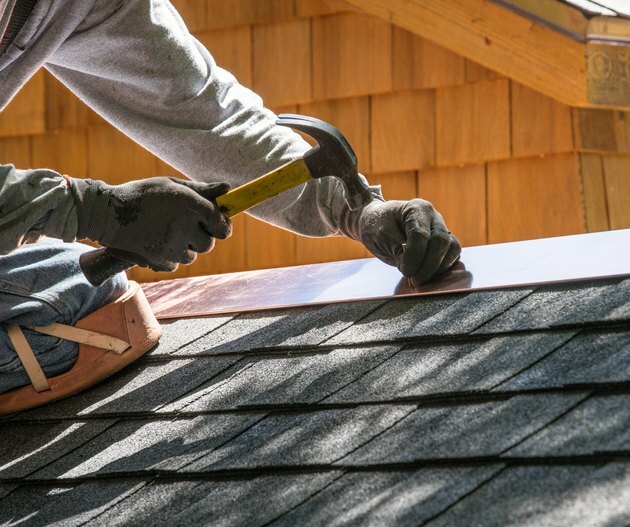 Don't let these maintenance tips scare you from getting a metal roof. Metal has many advantages over asphalt shingles or tile. Metal is resistant to fire, mildew, insects and rot. Metal is lighter than tile and concrete tile. Metal roofs are very fire resistant, as long as the roof is not installed over wood shingles. Metal also reflects the sun's rays, minimizing midday heat on the house, which means you'll save on air conditioning bills. Even if you have minimal roof pitch, metal will do a good job of preventing leaks. Metal is expensive, so unless you plan on staying in your house for a few years, you won't get a return on your investment. Oddly, metal doesn't typically attract lightning, but a metal roof can easily be grounded if you're worried about that. What Size Screws Are Used for Metal Roofs?